7130 Snowspeeder was released in 1999 as part of the Star Wars Classic line. It contains the first model released of a snowspeeder, and a turret. Included are Luke Skywalker (Rebel Pilot), Dak Ralter and Hoth Rebel Trooper minifigures. 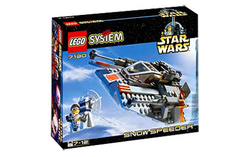 The Snowspeeder is mainly built up of light stone grey and orange pieces with a 6x16 tan baseplate. On the left and right of the ship are tilted wings, which can be moved up and down, with orange radiators and grey tiles on top of it, as well as the two main guns. Behind the main guns are dark stone grey fins, and two grey and orange sloped pieces, connecting the wings to the back of the ship. On the back of the ship is a black engine, and also the grapple gun used to bring down AT-ATs on Hoth. At the front of the ship is a sloped piece with a decal representing an orange design with a grey vent above it. The cockpit is just above, a transparent piece that can be moved up and down, for the pilot to control the ship. Behind the pilot's seat is the gunner and co-pilot's seat, with a transparent windshield in front of him that can be moved up and down and a computer brick with a picture of an AT-AT in crosshairs. Between those is a box for storage of Luke's lightsaber hilt. The Turret is built up of a radar dish piece with a grey circle piece and a white stick, representing the gun, and can be moved up and down. The Turret appears to be built on a light stone grey rock. A small, flat white baseplate is underneath this, the snow on Hoth. The Snowspeeder was used by the Rebel Alliance on the icy planet of Hoth. When the Empire discovered them and attacked, many Snowspeeders were deployed. They were fast, difficult to hit and even brought down a few of the Empire's nearly indestructable AT-ATs by tripping them with their cables. Snowspeeders were also used to locate Han Solo and Luke Skywalker when they were reported missing. This they did successfully. The set was included in the set 78744 Star Wars Value Pack. This is the first model of the Rebel Snowspeeder that LEGO created; a larger Ultimate Collector's Series model 10129 Rebel Snowspeeder was released in 2003, and an updated model 4500 Rebel Snowspeeder was released in 2004, which was similar in size to this one and contained the same characters and a turret. In 2007, another version was released in the set 7666 Hoth Rebel Base, and again in 2010, yet another version, very similar to the 2007 version, is released in the set 8089 Hoth Wampa Cave. This set is mostly grey, while the actual Snowspeeder is white. This is a description taken from LEGO.com. Please do not modify it. Delay Imperial troops in the snowspeeder! On the frozen planet Hoth, Imperial walkers search for the Rebel's hidden base. Join Luke Skywalker and Alliance Pilot Dack in the snowspeeder as they try to delay the attack long enough for the Rebels to escape. The Hoth trooper uses his radar to locate the snowspeeder. But Luke knows no fear - the snowspeeder is armed for battle with two forward laser cannons and a rear facing harpoon gun. Delay Imperial troops in the snowspeeder! On the frozen planet Hoth, Imperial walkers search for the Rebel's hidden base. Join Luke Skywalker and Alliance Pilot Dack in the snowspeeder as they try to delay the attack long enough for the Rebels to escape. The Hoth trooper uses his radar to locate the snowspeeder. But Luke knows no fear - the snowspeeder is armed for battle with two forward laser cannons and a rear facing harpoon gun. This page was last edited on 9 January 2016, at 20:32.